This piece originally appeared in The City Journal. Submitted by jennacatlin4 on Thu, 05/21/2015 - 01:53. Submitted by grcarch@charter.net on Thu, 08/02/2012 - 12:37. Kotkin's characterization of L.A. is one of coffee table books selectively featuring its storied history as photo essays. From my own experience as a long-time Southern Californucopia resident, the lovely shady enclaves mentioned are few and far between outside upscale neighborhoods. Traffic congestion? Has Kotkin driven the freeways and arterials of L.A. and its satellite cities lately, or even once in the last fifty years? 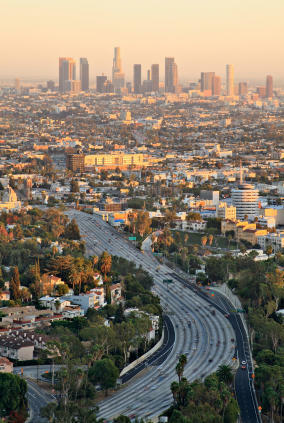 L.A. is iconic for peak-hour traffic snarls, Sunday crawls, and general stop and go journeys to and fro across the map in search of goods, services, but especially, employment. I'm no particular friend of high-rises, but greater density is certainly desireable, inevitable, and do-able, even without overly tall structures. Increasing densities will further justify existing mass transit, and underwrite future public transit growth. Again, Kotkin comes through for that part of the development industry uneasy with change for fear it will alter the familiar money game and the bottom line. In that, they are correct to be concerned; it will. Change or languish, as the old entrepreneureal mantra goes.